Shielding itself in arcane guise to keep laymen away and, thereby, to shun any possibility of democratic supervision, finance has always created reality out of beliefs and stories, turning appraisal into numbers on which their trades are based. Fluctuations in markets reveal more changes in the minds of traders than actual variations in the companies traded. Being mainly composed of reflexive actions, the markets operate in a vacuum, a world closed in on itself. The high volatility of finance seem to reverberate the ‘nothingness’ on which it relies. It is a world that artists understand well, challenging its power with its very means. What after all is an artwork? In literal terms, it is production time and material turned into an object, a commodity. The commodity’s value is not dependent on its inherent properties, however, but on the narratives attached to it – narratives built from the discourses and actions of collectors, curators, art historians, and so forth. What after all is an artwork? In literal terms, it is production time and material turned into an object, a commodity. Thus this value is not objectively determined. ‘In short, the value is not in the product but in the network’ argues artist and theorist Hito Steyerl, describing art as ‘a networked, decentralized, widespread system of value’ while comparing it to cryptocurrencies whose value is, as we know, not guaranteed by any central institution and whose state is maintained through distributed consensus. As the history of art is rooted in the subjective theory of value – despite a few historical attempts to rationalise the labor of art1–, so is the act of collecting art objects. ‘The mechanism of the collection makes it possible, in the same way as financial transactions when they deviate from investment stricto sensu, to generate scarcity from everything or, which amounts to the same thing, nothing – including waste – since by relying on the construction of serial forms of totalization, it creates gaps that imperatively require to be filled.’2 The libidinal power of capitalism could not express itself more clearly. Behind every artwork or so stands a commissioner, a buyer, someone to evaluate it. Most contemporary artworks rarely reach the public eye. Emerging artists’ works will be displayed in independent art spaces with a reduced audience; if the artists are the slightest bit successful, the works will be shown a few times in galleries and fairs mainly attended by professionals and jet-setting collectors; and, if the works are sold, they will probably end up out of sight in some private collection at best, or in a gallery storage from where they will never emerge, if not in climatised crates in some free port along with wine bottles and cigars. So why buy art then? Because it’s easier to manage than buildings? Or because of the relative murkiness of the market? The real numbers of this market are never precisely disclosed and the opacity of the reports put out by some of its insiders thwart attempts to establish them. Not to mention resorting to fake bids at auctions and to offshore companies as disguised owners. Artworks thus make great speculative assets. Buyers share a common interest in keeping their prices high and, to avoid paying import and other taxes, the wealthiest use free ports to store their works: despite changing owner, some works are never unpacked, simply shifting from one assets balance sheet to another. For the researcher Max Haiven, the real purpose of free ports ‘is to remove art from worldly circulation, while preserving it for purely financial or speculative circulation’, to liquefy art ‘into a market substance.’3 Oscillating between safe-haven investments and speculative bubbles, the art market appears to be a synecdoche for financialisation. We talk about patterns in financial analysis as much as in painting. Sometimes art even goes so far as to reflect its very fluid conditions. Whereas each painting of the series Strings Attached (2015) by Jonas Lund takes charge of its own appearance on the market by bearing sentences such as ‘This painting may never be sold at auction’, ‘This painting must be resold by March 21, 2017’ or ‘This painting must be sold to a collector based in Mexico’, embodying the discrepancy at work in the activities of any art gallery that attempts to develop its artists’ careers while fending off pure speculation, some artists such as Sarah Meyohas or James Gubb go even straighter to the point, making financial markets their medium, drawing with stock prices, in the market representations. When Meyohas said she was looking at her performance (2015-16) ‘as a line first, then a stock’, explaining that she chose a specific stock to trade ‘because of its name, and because nobody else was doing so’, making all movements of the line of the stock her performance, which she ‘executed at precisely 20-minute intervals to delineate intention’, she was exposing the literalism of the markets, its reality created by its own actions. Sarah Meyohas, Stock Performance, 2015. James Gubb – an experienced trader turned artist – drew a middle finger (2017) on the Johannesburg stock exchange as a sign of protest against a massive financial fraud, a gesture for which he was fined on the grounds that: ‘these transactions created a false and deceptive appearance of the trading activity’. Making finance visible has long been an obligation for artists, which can be traced back to the origins of the links between artists and money 4, that is to say at least to 35 BC when the Roman arts sponsor Caius Cilnius Mæcenas appeared as a character in Horace’s Satires, which he had patronised. The Middle Ages and much more the Renaissance 5, of course, saw the expansion of this practice – with the patrons generally depicted among the background characters of the religious scenes in the paintings they had commissioned – until it became a subject of interest in itself in the painting of Gustave Courbet. Highly influenced by the utopian socialist thinking of Fourier and closely connected to Proudhon, Courbet aimed at what he called ‘a democratic art’, an art about the people and for the people, produced independently from the state support and not meant to please the Parisian collectors. La Rencontre, that he painted in 1854, is emblematic of his views: it challenges the fawning deference of the sycophant poets and painters to their patrons with a composition veering to anarchism, depicting the artist himself as an equal of the person who had commissioned him, and even slightly looking down on him. A few years earlier, in 1845, the British photography pioneer William Henry Fox Talbot took four exposures of the London Royal Exchange – which had just been rebuilt after it burnt down in the very year photography was publicly presented as a new technology – devoid of activity. What sounds like an anecdote actually forms the base of Zachary Formwalt’s ongoing film series revolving around the idea of documenting the movements of capital. In Place of Capital (2009) starts with an impossibility stated in a voiceover: ‘the activity of finance is not particularly visual per se. It’s not like watching a car get made on an assembly line. You could have a lot of charts and graphs to show movements of money but I’m not sure you’re ever going to capture the movements of capital markets cos there’s not much to see. Specially now that everything is electronic.’ Through the prism of image making, the artist addresses the matter of the (in)visibility of finance, of capital. In his 1844 Paris Manuscripts, Marx defines money as the medium for turning ‘an image into reality and reality into a mere image’. Money, like photography, freezes the process that led to its appearance as a fetishised object. But in any way, capital’s movements elude photographic capture. ‘When capital assumes the form of money, its movements, its history vanishes’, adds the voiceover. From one façade to another, the camera moves from the Greek temple-like Royal Stock Exchange to the sleek glass and steel ABN AMRO headquarters in Amsterdam to reflect on a story that broke just as the film was being made. A seventeenth-century Dutch painting depicting Amsterdam’s flourishing real estate development along its canal that had been acquired by the Rijksmuseum the year before was then claimed by the US bank JP Morgan Chase and by ABN AMRO. The canal view had been used as a collateral on loans that the collector had ceased to reimburse, and it’s a delicious irony that when Zachary Formwalt was examining the use of images of corporate buildings’ façades as press illustrations for financial news – the starting point of his research –, this painting of façades of the city’s most expensive buildings was in itself incarnating capital’s movements, and making it both visible and opaque, as does any façade, being both a closing surface but also an entrance to the inside. If part of it resembles the average Jane & Joes’ library, with its best-sellers and thrillers, it’s not just that it included technical finance manuals that made it look prophetic, it’s our reading of these titles post-factum. Sons of Fortune, Backlash, No Second Chance, End in Tears, White Shark or even The Oath, signed by its author Elie Wiesel – whose foundation lost US$15 million in the scam –, have been carefully displayed on a very long shelf by the French artist for Forget The Money (2011). Ironically enough, the artwork – the books bought by the artist but resold with added artistic value – was purchased by a French whistle-blower who had revealed an important political-financial scandal in 1999. The Madoff Ponzi scheme is what we commonly call a white-collar crime – a financially motivated fraud committed by business or government professionals. Observing that predictive policing systems disproportionately target “street crime” rather than white collar crime, the Dark Inquiry team devised a white-collar crime-prediction tool that uses the same methodologies used by similar law enforcement in the US, the Netherlands, Germany, Switzerland and China, and tested in other countries such as France, but using a data set they filled with information retrieved from the US Financial Regulatory Authority. White Collar Crime Risk Zones is now an iOS app conceived to alert its users when they are entering high-risk areas for financial crime. It is designed as a heat map covering the US and its territories (and Bermuda), showing the likelihood of the occurrence of a crime in a specific zone, its nature, approximated severity, and, for New York City, the average face of the potential criminal per zone. White Collar Crime Zone, interface. In order to do so, Brian Clifton, Sam Lavigne, and Francis Tseng scraped the profile pictures of 7,000 corporate executives working in finance on LinkedIn to generate those faces which, despite being all unique, look almost all the same: like a relatively young white smiling male, for a change. While Delaware stays strangely greenish on the map, Manhattan is crimson. Under the aegis of The New Inquiry of which the Dark Inquiry is part, the app is referred to as a piece of ‘rhetorical software’, a critique that ‘is not merely speculative or performative; but which actually enacts its proposal’, in other words, criticism taking action. This work was actually so effective that a cybersecurity specialist mistook it for one of the many systems used by the police and denigrated it in an article considering the biases of AI in predictive policing. And while data visualisation becomes the new landscape painting, finance is one of its hot topics. The specificity of Mark Lombardi’s work is that it dares to go further than any journalist would in one and the same piece. 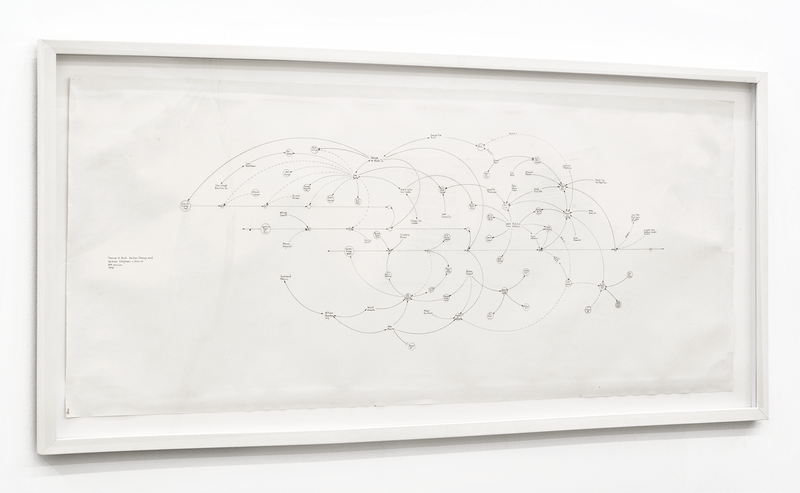 Pulling the threads, pushing the limits of connections, his drawings depict diagrams which invite the viewer to investigate the links represented by various kinds of arrows placed between key players in contemporary power relations that led to major events. A very good example of these is George W. Bush, Harken Energy and Jackson Stephens c. 1979-90 (1999 for the last version), five versions of which having been painstakingly produced – updating his drawings when new pieces of information surfaced was indeed part and parcel of Lombardi’s practice. Mark Lombardi, George W. Bush, Harken Energy, and Jackson Stephens, c. 1979 - 91, 4th version, 1998. Graphite on paper. Photo: Gianmarco Bresadola. Courtesy of Robert Tolksdorf. Exhibition ‘Evidentiary Realism’ at Nome gallery, Berlin. Based, like each and every of his charts, on publicly available information, this one traces a network of actors – individuals and corporations – involved in the Iran-Contra affair, in the Gulf War, in Cayman Islands front companies, in the BCCI, UBS, etc., and revolving around the figures of George W. Bush, George H.W. Bush, Robert S. Mueller, Sheik Salim bin Laden, Sheik Mohammed bin Laden, and Osama bin Laden, among many others, mainly through the name of James R. Bath. Money laundering, tax evasion, arms brokering and terrorism financing are here exposed simply, freehand drawn on paper with graphite or ballpoint pen, in a form that has been described as ‘a post-Conceptual reinvention of history painting’ whose great force comes from all the space for interpretation it leaves to the viewer. Breaking the linearity of the narrative, ‘presenting nothing but data and pattern, Lombardi reminds us that data is pattern’. Eschewing the internet or computers in his research and production process, Lombardi mapped a global history of the clandestine paths taken by money in these late-analogue age artworks which defy, in their austere look, the many luxuriant digitally generated data visualisations that now populate media and exhibitions. ‘presenting nothing but data and pattern, Lombardi reminds us that data is pattern’. Among these, we could mention The Mossack Fonseca Universe (2016), an interactive map that deploys the network of shareholders, companies and agents that have used the services of the law firm, designed for the news website Fusion by the aforementioned Brian Clifton. Artists producing investigations7 and news media publishing visualisations echo the fine line there is between those practices, and although Clifton who now works as a data scientist says he used to be an artist, implying that he no longer wishes to be considered one, the White Collar Crime Risk Zones – which wasn’t thought of as art by its creators – was regarded as such by the art world. Soon after 9/11, an FBI agent asked the Whitney Museum to examine the Lombardi’s work they had acquired. Not only are the representations of finance really abstract, but the very idea of finance itself becomes increasingly so as it becomes more complex, embedded in the increasing financialisation of economies. According to the Dutch artist Femke Herregraven, the vocabulary of finance is deliberately abstract and all the metaphors used to describe its processes render it more opaque. Funnily enough, images of water, such as ‘flows of capital’, ‘the market has frozen’ or ‘evaporated’, ‘ripples’, ‘tides’ and ‘waves’, could induce an idea of transparency, but this is not so. ‘Offshore’ is one of them. All those words seem to express a willingness to consider finance and, more broadly, economy, as a natural phenomenon, although it is of course a purely human construction. Offshore, with the image of a far-off island it conveys, is probably used to disguise the fact that actually most of the tax havens are continental, even OECD member countries. In 2014, Swiss financial centres were managing a third of the global offshore finance while the rest is mainly circulating in UK and US dependent territories. The Dutch government, for instance, promotes its favourable fiscal climate the way it would do with any other locally sourced product, as Herregraven likes to remind us. 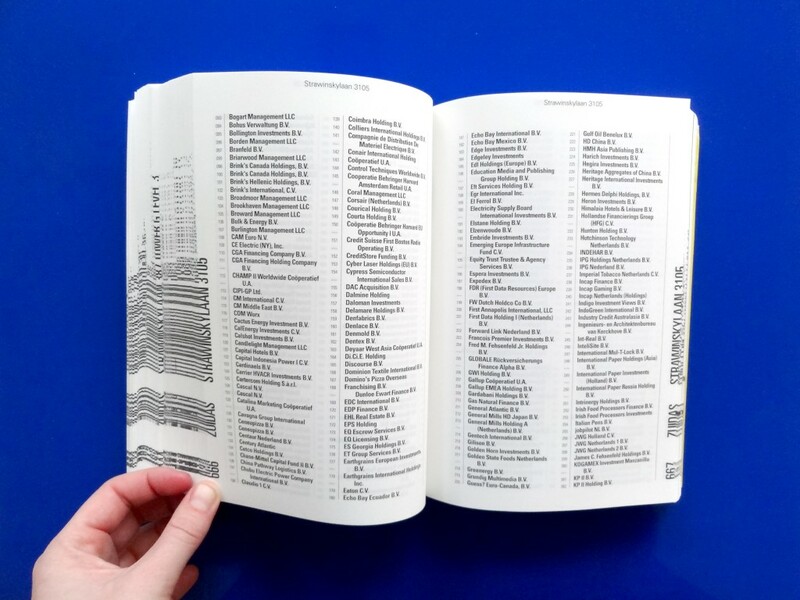 Thus, in 2011, she went to explore the Zuidas, Amsterdam’s business district where ABN AMRO headquarters are located and, from her research on the companies registered in the neighbourhood – but invisible there – produced a book that indexes them by address, uncovering thousands of ‘mailbox companies’ whose names required little effort as they are usually ‘declensions’ of one proper name followed by numbers or initials, as shown in the pages of this front companies directory titled Geographies of Avoidance. Femke Herregraven, Geographies of Avoidance, 2011. Book. 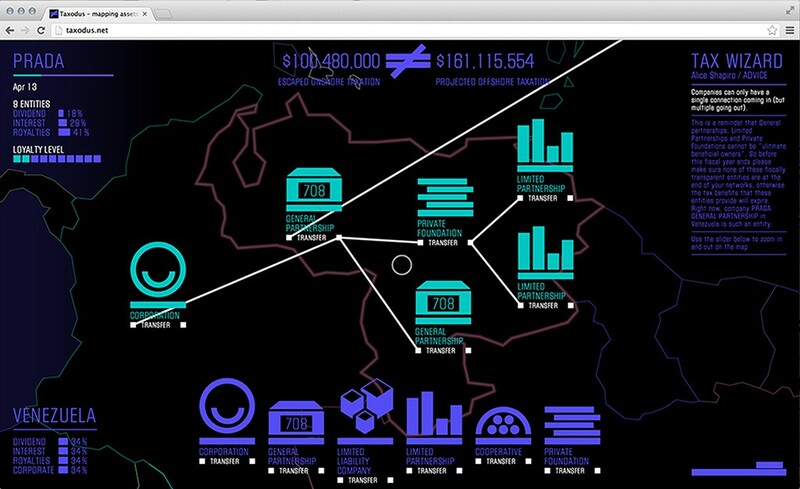 To make the procedures of offshoring more accessible to the public, she then designed Taxodus (2013), an online game incorporating real data about tax regulations and treaties, in which the players, on behalf of the major company of their choice, have to strategically avoid being taxed as much as possible. The chosen paths are recorded and made available in a public database that the artists describes as ‘a crowdsourced research in tax avoidance’. Femke Herregraven, Taxodus, 2013, Online game. A step further in interaction, the French art collective RYBN built the Offshore Tour Operator (2018), an Android app that couples a GPS function with the ICIJ Offshore Leaks database addresses (among which are the Offshore Leaks, the Bahamas Leaks, the Panama Papers and the Paradise Papers), and conducts regular workshops with its users. They have observed that once the app has helped them to locate and ‘visit’ nearby places, people dare to enter buildings, climb the stairs, ring bells, and sometimes even leave messages in the mailboxes, all things they wouldn’t normally do wandering through their neighbourhood. RYBN, The Great Offshore, Valletta Offshore Tour, Malta, 2018. The app enables a superimposition of relatively abstract and distant information onto a familiar geography (as people tend to use the app in the city where they live, although it can also serve as a touristic tool) and increases user’s attentiveness to their surroundings, pushing them to notice small details that might or might not be related. This piece stems from a larger research project entitled The Great Offshore (2017) that RYBN presented at the last edition of one of the Basel art fairs8 along with pictures of the Swiss city they had shot while sightseeing with the app prototype. 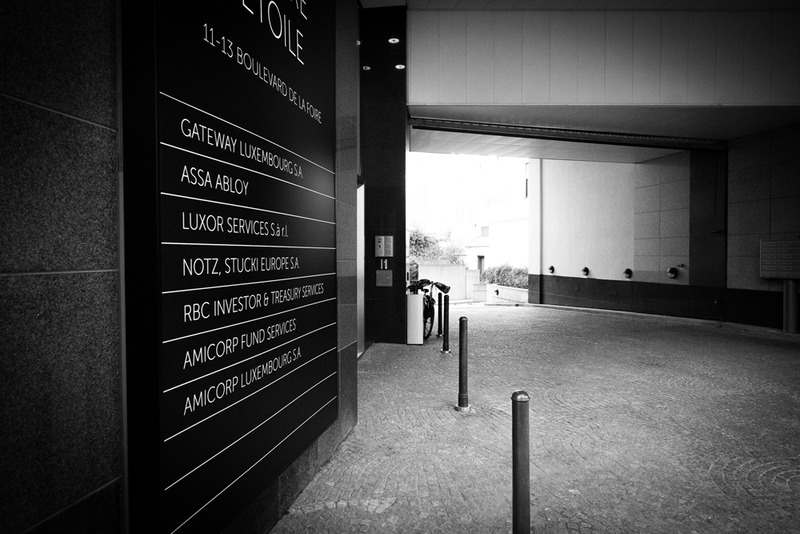 RYBN, The Great Offshore, Luxembourg City Offshore Tour, Luxembourg: Stock Exchange Quartier, Luxembourg City, 2018. Unsurprisingly, the visitors’ reactions were utterly interesting: some said ‘Luckily, our place is not on the pictures!’ and others, inspecting the Algoffshores also exhibited, commented on the flowcharts representing strategies of offshoring and tax optimisation schemes making use of the art market, saying ‘My method is missing there!’ and advising the artists. One of the Wildensteins’ lawyers also dropped by and asked for copies of some of the exhibited documents. 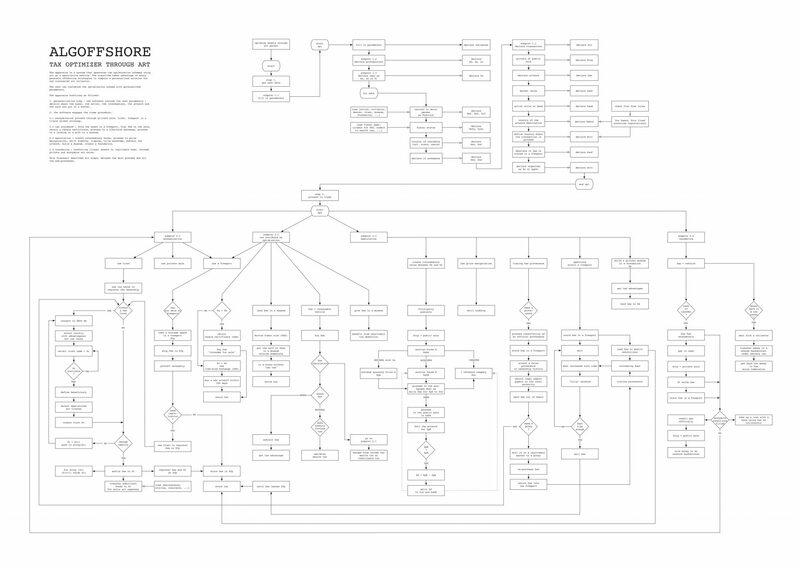 RYBN, ALGOFFSHORE 2: TAX OPTIMIZER THROUGH ART, 2018. The conversations were relaxed, the visitors who could relate to the works read them as tokens of recognition, as part of their daily business. But when the same works were presented in a technological innovation context at a trade fair in Canada, the reactions were totally different, rather offensive, people reading the project as a provocative denunciation. Although the codes of the White Collar Crime Risk Zones app and the Offshore Tour Operator are both open source, it might be here that we can really see the difference between what are intrinsically art projects and projects that bother people to the point where they prefer labelling them as art. The art project deliberately presents itself as open to interpretations, to be understood either as an unveiling of wrong practices that make constitutional states loose money or as an apologia for evasion with anarchist leanings, or even as a critique of those same constitutional states for allowing and supporting those shady strategies. The ‘criticism’ project goes more directly to the point. 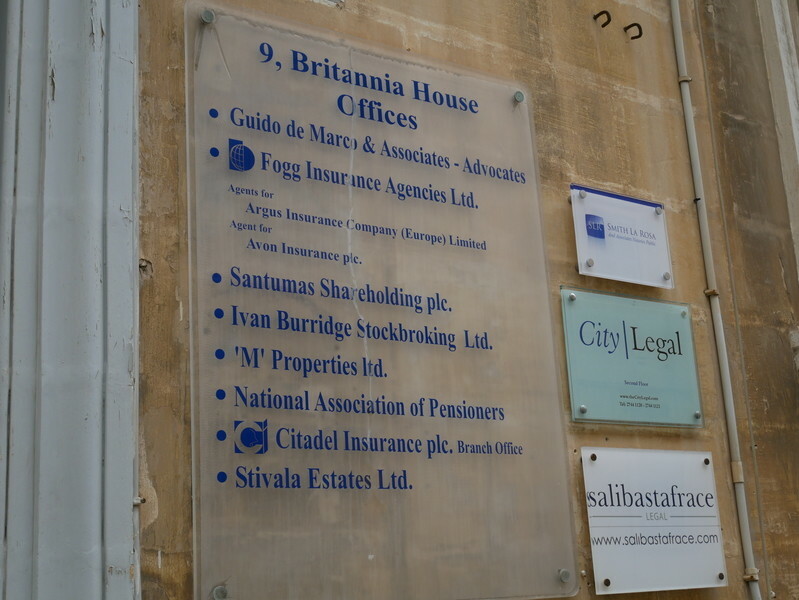 Soon after Femke Herregraven’s indexing of the Amsterdam-based front companies, Paolo Cirio started to look into the Cayman Islands’ government website to discover which companies were incorporated there – it is common knowledge that these islands are the world capital of hedge funds. While Herregraven drew up her list manually from the Dutch Chamber of Commerce register, the Italian artist supposedly hacked into the Cayman’s company register to find the fiscal identification numbers and subsequently drew up a list of the 200,000 companies registered there. Owing to the financial privacy offered by the country, the names of company owners are undisclosed, which led Cirio to propose hijacking their identities to anyone for 99 cents. Selling mockeries of certificates of incorporation used by shell companies, Loophole for All (2013) was advertised as such: ‘pirating offshore companies to practice tax resistance’. Around 700 people claimed their certificate, from sleazy Russians asking for a lot of details to Spanish farmers snowed under with taxes by way of many freelancers wrestling with invoicing, explains the artist. As with all his spectacular projects, the main aim was to raise awareness on both sides – those unaware of the system, and those exploiting it. The best part was probably when on the national Cayman news, the government denied the hack and reassured the companies that their businesses were ‘safe’, following which when PayPal deleted the account to which sales revenues were sent, on the pretext that ‘PayPal can’t be used to sell or receive payments proceeding from items that support or promote any kind of illegal activity’. Paypal being, as Cirio reminds us, incorporated in… Luxembourg. Part of this artwork thus takes the form of a certificate, widely distributed, as opposed to the masterpieces of Conceptual Art quite often seeing their value only incarnated in a single piece of non-reissuable paper: a certificate of authenticity (for which, since 2015, there is specific insurance coverage since the value of these works is not in their physical manifestations but in the instructions to realise them). The story doesn’t say if those newly Cayman-based companies’ inauthentic owners followed up and actually used their somewhat fictional certificates. Offshore is quite often described as a fictitious place that persists only because some want it to keep existing and thus decide it exists.9 ‘You cannot go offshore, but your money can.’10 Since money officially left the regulatory space in 1957 when the Bank of England allowed the US dollar to be traded in The City of London banks without reference to the federal reserve board, it could escape, vanish. Offshore is quite often described as a fictitious place that persists only because some want it to keep existing and thus decide it exists. Offshore is a story in which characters are fleeting, hiding behind names and numbers that act as screens and masks. The Swedish artists duo Goldin + Senneby, whose work has been tackling the world of finance for more than a decade, mostly do so through the prism of fiction, via collaborations with playwrights, actors, novelists and so on, including auctioning in 2010 the right to appear as a character in their to be ghost-written novel. More recently, they became interested in the practice of short selling and, in particular, in one of the successful firms practising it, a California-based company created by a former Hollywood screenwriter and artist who has purportedly conceived the idea for his hedge fund while looking at a Mark Lombardi drawing. A short investor is someone who borrows shares and sells them, hoping their value will fall in order to buy them back for less, and thus generate added value. 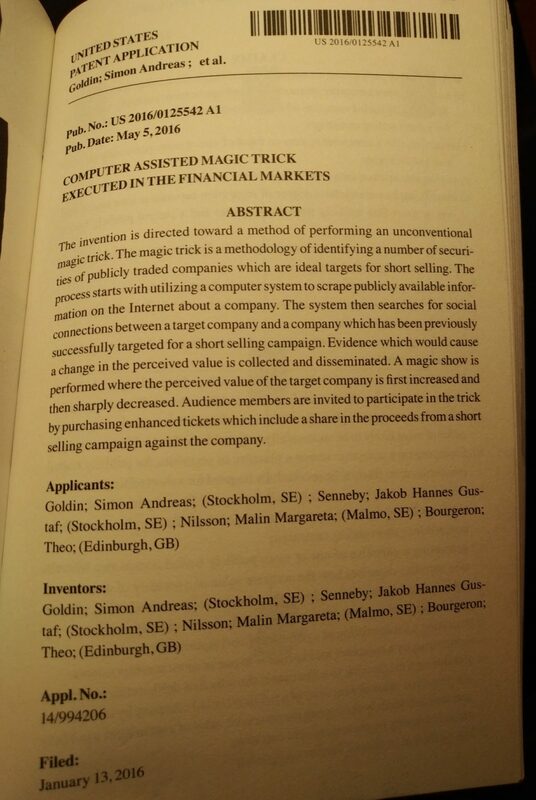 For Zero Magic (2015-), which they define as ‘a trick for the financial markets’, Goldin + Senneby hired a sociologist of finance and a magician to design the trick inspired from a shady practice in short selling, which is that of investigating fraudulent companies, then borrowing/selling their shares and dropping their value by alerting the press about their frauds. One of these frauds could be that of artificially inflating its own stock value by means of hiring a reputation manager who would place laudatory articles in newspapers. Both practices involve crafting narratives to either drop or raise a company’s shares value. ‘In the financial world, it is considered illegal to hire freelance writers to boost the value of a company through spreading affirmative narratives about it. In the art world, it’s how we make a living’, observes one of the numerous writers commissioned to produce textual matter about the artists. Goldin+Senneby, Computer Assisted Magic Trick Executed in the Financial Markets, 2016. Patent application, as published in Proxy Politics, Power and Subversion in a Networked Age, RCPP ed., Archive Books, 2017. The patent is of course an amazing reading, minutely detailing the strategy while linking finance to magic in such an obvious way that it sounds, after a few pages, absolutely natural to do so. Except the patent, the artwork here takes multiple forms, from the correlation of facts made by the different writers who collaborated on the project to the certificates of shares ownership distributed during a magic live show, and you’re starting to wonder if the artists themselves are not making use of one of those reputation management ghost writers as you see your browser pages filled with articles concerning the facts you were starting to consider as entirely made up. 'Anyway the trick allegedly was performed on April 21 of this year, and the stock did in fact go up a bit, and then down by some 33 percent, over the next three weeks, so there you go’ notes a dubious Bloomberg opinion columnist. There’s a long tradition of connecting finance with occultism, the latest of which possibly being the self-proclaimed research laboratory Unbewitch Finance created in 2017 that organizes workshops, games and rituals such as full moon meetings in the Brussels World Trade Center and even set up a satirical crash brirthday party on 15 September 2018 in front of the Brussels stock exchange, concurrently with the former Lehman Brothers bankers’ parties scheduled in the main financial capitals the same day. Whether or not performed, Goldin + Senneby’s magic trick wouldn’t have been the first artistic intervention into the financial markets. We’ve already mentioned Sarah Meyohas and James Gubb manipulating stocks for aesthetic purposes ; RYBN, to come back to them, has been running a trading bot on the markets since 2011. 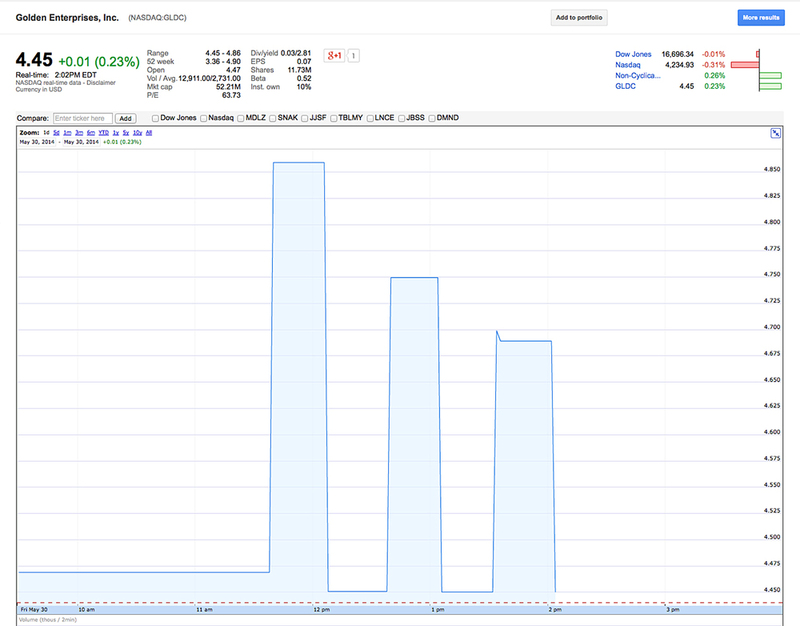 ADM 8 is actually a trading algorithm not conceived for profit but oriented towards its own bankruptcy, as it’s programmed to stop acting when it runs out of money. Beginning its activity with a fund of US$10,000, it’s been investing and speculating on its own for more than seven years, with more than 2,000 transactions exectued – roughly one per day. This infiltrated bot that went online a year after the first flash crash embodies a critique of credit brokering as it can only trade if funded, and a critique of the opacity of the ultra-specialised algorithms that operate on the markets with its open-source code. If finance and money can be described as irrational systems of collective fictions, at both a general and a factual level as we’ve seen with the storytelling practices at play in the ‘pump and dump’ schemes or in ‘stock bashing’, then it is possible to counter these with other narratives. For Give Me Cred (2013), Cassie Thornton put up an alternative credit-rating agency to produce auxiliary credit reports with the aim of challenging those opaque scores attributed to people simply on the basis of numbers. She gathered all the information those credit reports were leaving aside, such as the payment of an emergency bill that could suddenly lower someone’s score, by meeting people who would volunteer their stories and then providing them an official-looking document that summarised it all. And she says this strategy was successful for many people who were struggling to find an apartment in San Francisco – where she was based at the time – when the tech workers invaded the city. She believes that probably more than the form she completed about those persons, what worked was that their conversation empowered them and made them look more confident when they met potential landlords. Here again, the value of the artwork lies not in the object itself but in the network, even more so if we take the word value in the sense of an intrinsic quality. 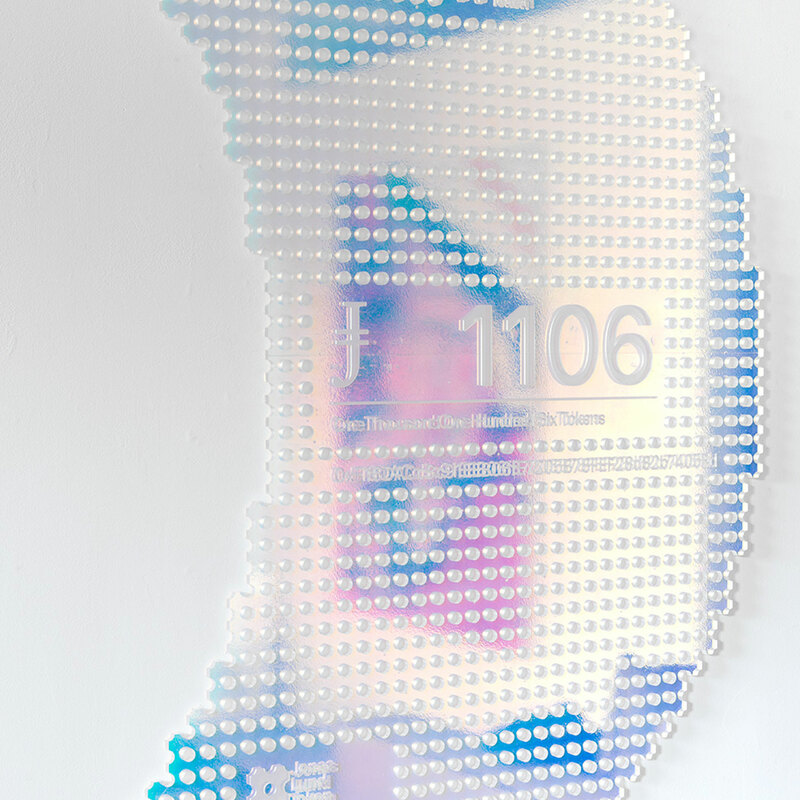 Jonas Lund, JLT 1041, 2018. Painted wood. Many artists, among whom the above-mentioned Jonas Lund (with his Jonas Lund Token, Lund has opened his artistic capital to shareholders giving them agency over his practice) and Sarah Meyohas, our dubious Bloomberg opinion columnist’s favourite artist for her pragmatism12 (with her BitchCoin which ‘allows art collectors to invest directly in Sarah Meyohas as a value producer rather than investing in the artwork itself’, BitchCoin giving Sarah Meyohas ‘a stake in the supply, demand, and price of her own work’), have played with the idea of cryptocurrency, building their own, although most of these projects don’t aim for real effectiveness beyond adding to the speculation on their creators’ careers. 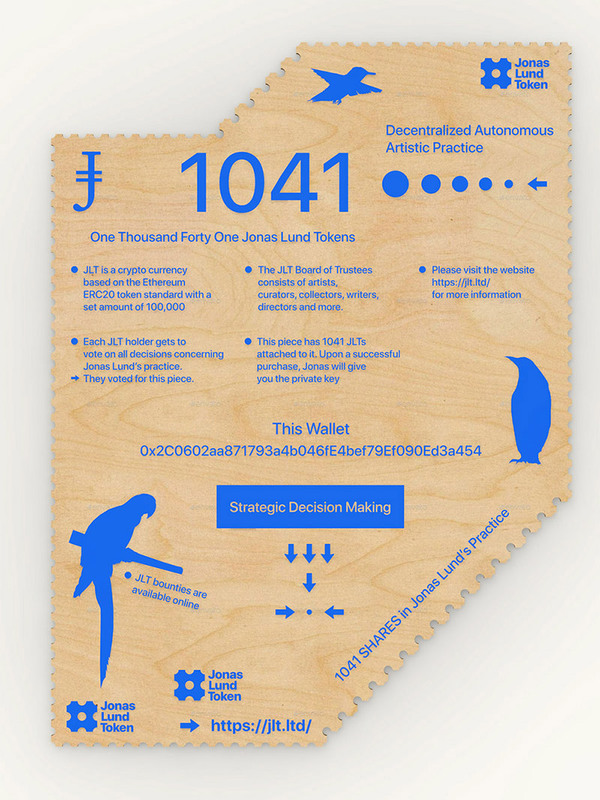 Those coins and tokens are viewed as pure artworks, that is to say production time (although crowdsourced) and material (those tokens are backed by physical objects) turned into objects (also in the sense of an object of thought) the value of which is subjective. In the case of Lund and Meyohas, a blockchain-based form of patronage. There, money is the medium. But what if it were the medium and the end? Today, most currencies are fiduciary, which means that their face value is in disproportion to their material value, just as for artworks. The trust in the value of these currencies is guaranteed by institutions such as states and central banks, whereas the trust in the value of the artworks is guaranteed by what Hito Steyerl called the network, or in other words, the art world, made of ‘institutions’ such as museums, galleries and auction houses. The labour theory of value, mainly advocated by Adam Smith, David Ricardo and Karl Marx, recommended that the value of a commodity should be measured objectively by the average number of labour hours necessary to produce it. But Bitcoin has not been programmed as such. ‘As more computational power, representing ever greater amounts of labour, is employed in Bitcoin mining, the number of Bitcoins produced does not go up, instead, the value of each Bitcoin goes up’ explains Kleiner, for whom Bitcoin ‘is irrational by design’ as ‘there is no fixed ratio between work and coin’. So, to keep up with the original idea of Bitcoin, which was that of a decentralized money enabling anonymous transfers of value between peers in a network, Kleiner, together with Baruch Gottlieb, his partner in the Telekommunisten art group, is creating The Haket – an artistic, functional, non-speculative, rational cryptocurrency based on the Marxist theory of money, a cryptocurrency with a stable value indexed to a consistent work/coin ratio – work meaning here the amount of computation put into the production of the coins. Unlike non-collateralized stablecoins projects roughly based on the Quantity Theory of Money, which evaluates changes in the demand and adjusts the supply of the coin with its price, here is an asset – and an artwork – that prices itself from its own materiality (which sounds reasonable in terms of stability, considering the rather low volatility of the electricity prices for now). Furthermore, drawing on Gottlieb’s long-time reflection on the materiality of digital technology, The Haket is designed to be mined with obsolete hardware, endowing the project with a hint of techno-criticism ready to confront the usual propaganda of innovation. The liquefying of art into a market substance, into a purely subjective and speculative value disconnected from its material reality, incarnated or resisted by the artworks discussed here – to the point of artistic interventions into the financial markets, to the point of becoming money themselves – might conversely demonstrate that art will always be a little more than just a financial instrument. Even when it tries to mimic its appearance and operations. The first example of which may be the painter Georges Seurat who, when asked the price of a picture painted 12 years after the French edition of the volume 1 of Capital, ‘wrote that he was very much embarrassed in fixing the price; that he reckoned it as one year’s work at seven francs a day, but that he would be willing to reduce it if he liked the personality of the buyer. Thus Seurat rationalized even his own labor as a sum of units of work, in contrast to his contemporaries, who identified every stroke with the experience of a lifetime or the priceless effect of inspired genius.’ Shapiro, Meyer (1935) ‘Seurat and La Grande Jatte’, The Columbia Review, XVII (1):16. ‘For Seurat, whose circle was known for its leftist political views, it partakes of a genuine democratic identification with (manual) workers: he refused the idea of a difference between the production of art and that of any other object, considering his artwork to be like any other commodity, whose exchange value is determined, according to Marx (in his revision of Ricardo and Smith), by the quantity of “social” labor that has been expended in its production and is “crystallized” in it. In other words, Seurat chose to ignore the perturbations of the exchange value system engendered by the fluctuations of supply and demand, which are notoriously extreme in the market of luxury goods—and particularly in the art market.” Bois, Yve-Alain (2013) ‘A Pedestal is a Pedestal is a Pedestal’, in Cheyney Thompson, metric, pedestal, cabengo, landlord, récit, Cambridge, MA: MIT List Visual Arts Center; London: Koenig Books, p. 6. Boltanski, Luc and Esquerre, Arnaud (2017) Enrichissement. Une critique de la marchandise. Paris: Gallimard, p. 292. Haiven, Max (2018) ‘The Crypt of Art, the Decryption of Money, the Encrypted Common and the Problem with Cryptocurrencies’, in Gloerich, Inte; Lovink, Geert and de Vries, Patricia (eds), MoneyLab Reader 2: Overcoming the Hype. Amsterdam: Institute of Network Cultures, p. 124. I would happily have written ‘the links between art and money’, if the notion of art as we understand it now, that is to say freed from political and religious instrumentalisation (although this obviously persists, which would be the subject of another essay), were not dramatically different from how it was understood until at least the late Middle Ages, let alone Modern times. It seems easier to talk about the artists, even though they were long still considered as mere craftsmen in the service of art, and thus, of political and religious powers. In ancient Greece and Roman times, the works were more indicative of the fervour of the patron than of that of the artist, and it was the patrons who controlled the production and left their names on the works. Renaissance being the golden age of patronage with artists passing from court to court in a competitive Europe of monarchies and city-states. Pasquinelli, Matteo (2016) ‘The Spike: On the Growth and Form of Pattern Police’, in Nervous Systems. Leipzig: Spector Books, p. 281. ’Mr. Lombardi's interest in presenting pure information qualified him as a Conceptual artist, but in many ways he was an investigative reporter after the fact’ wrote Roberta Smith in Lombardi’s obituary in The New York Times. The circumstances of the artist’s death remain somewhat unclear for some, especially for his close friends and family. RYBN was presented there not by a gallery but at the booth of the House of Electronic Arts Basel, an art centre financed by a mix of public and private funding. See Deneault, Alain (2010) Offshore, paradis fiscaux et souveraineté criminelle. Paris: La Fabrique éditions, p. 84. ‘She's a Wharton graduate who paints stock-price charts and sells them to hedge-fund managers. It is commerce all the way through. It turns out that the performative rejection of capitalism is not essential to artistic authenticity.’ Full article. Aude Launay is an independent curator and writer trained as a philosopher. A significant part of her writings and exhibitions deals with the influence of the Internet (as a hyperobject more than as a technical tool) and advanced technologies on contemporary art and society. 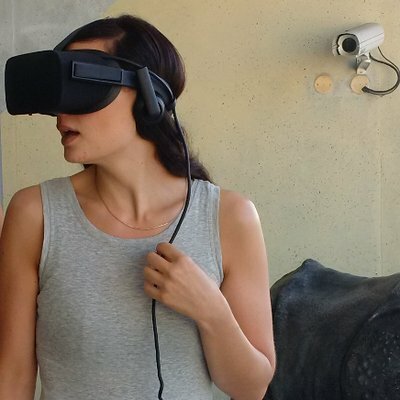 For the past three years, her research focus has been on crowdsourced and distributed decision-making through algorithmic and blockchain-based processes in art. More generally, she is interested in art that interferes with the power mechanisms underpinning governance structures.